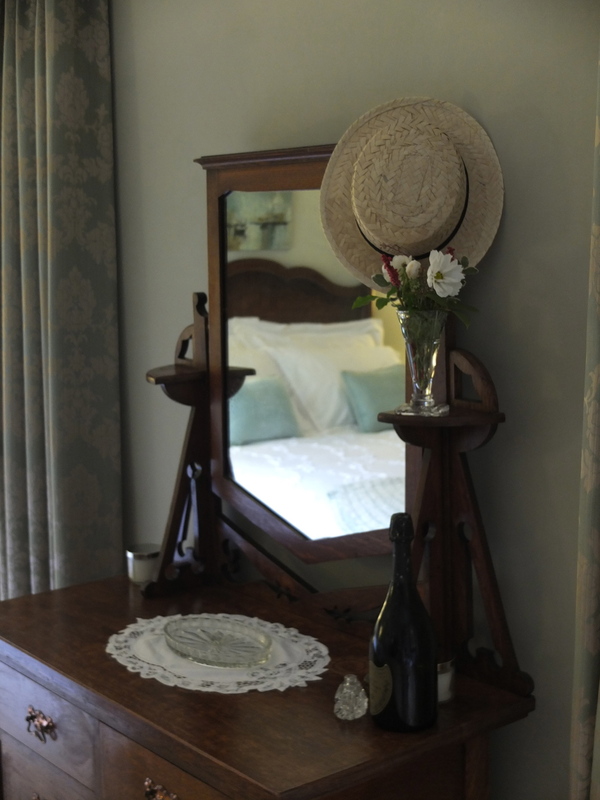 Coombe Trenchard offers its guests very special Country House Bed & Breakfast accommodation in a choice of 4 luxuriously appointed rooms, with either en-suite or private bathrooms. All the double bedrooms are spacious, with large comfortable beds, quiet seating areas with televisions, broadband wi-fi and views over the gardens and beyond. Walter Sarel was the Edwardian architect who designed Coombe Trenchard House & Gardens. ‘Sarel’ is a beautiful, proportioned West facing bedroom, offering space, comfort and privacy. Enjoy views from the window seats over the water-garden and woodland walks. An adjoining en suite bathroom with an Edwardian roll top bath, basin, WC and dressing table. The East Wing of Coombe Trenchard was originally the accommodation wing for the staff to to the main house and until recently had remained unaltered since the death of the squire, Henry Sperling in 1952. Philip & Sarah have sympathetically renovated and restored the East Wing, providing modern comforts, but without losing the sense of history. 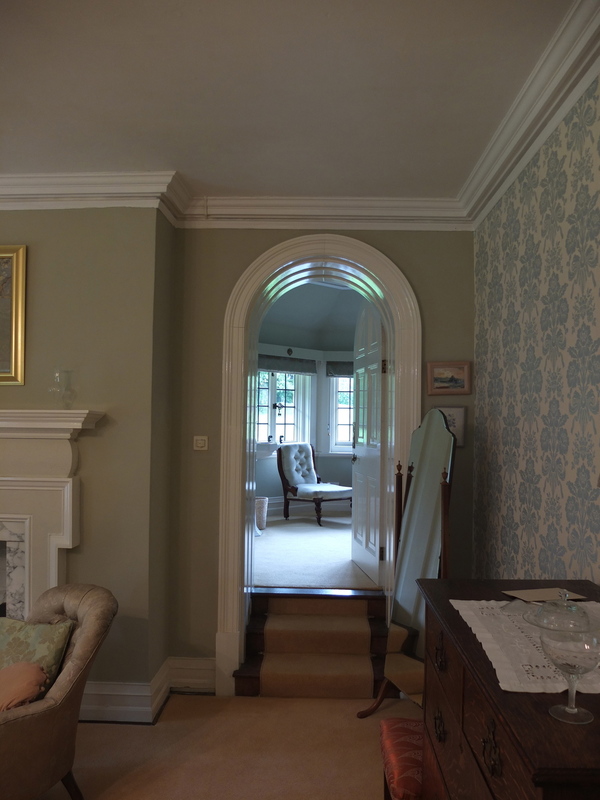 The East Wing has been decorated using traditional Edwardian colours with an Arts & Crafts influence. Antique pieces of furniture and object d'art in keeping with this era, grace the bedrooms. This is a good sized master bedroom with private dressing room and shower room. 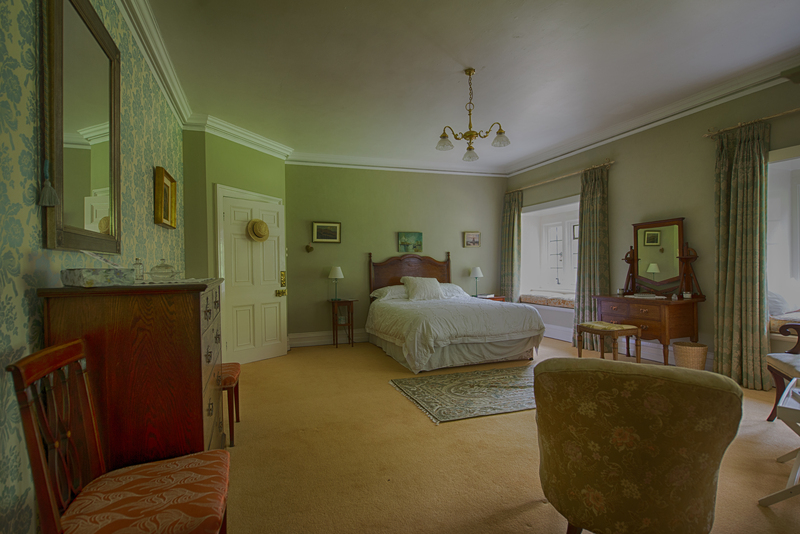 The Clock Tower bedroom is within the Italianate clock tower, overlooking the Bothy on the East lawn. 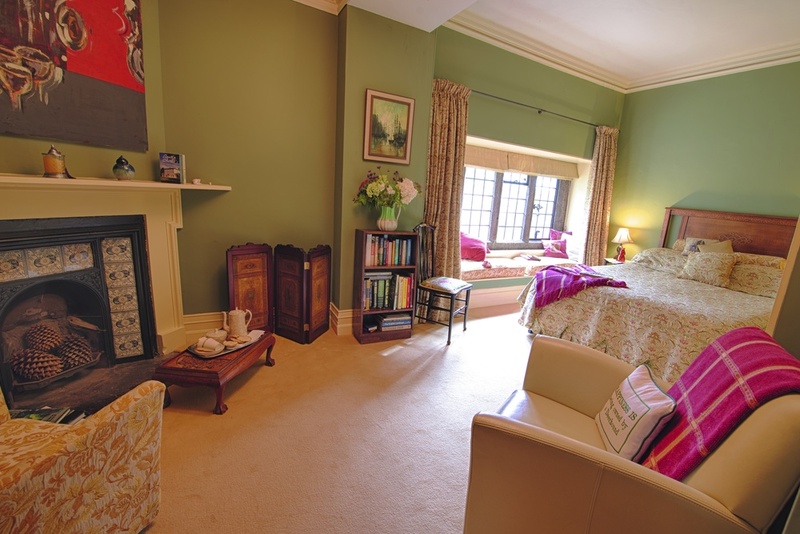 Beautifully decorated in rich warm colours with the comfort of a 5' bed and a relaxed seating area with television, around a cast iron Edwardian Fireplace. Adjoining your bedroom is a private dressing room. The perfect area to read or listen to music. It has a desk and Wi-Fi broadband access for those who want to use their laptops. A good selection of Arts & Crafts books together with a broader selection of holiday reading is available for your enjoyment. Shower Room: Walk-in luxury shower, basin and WC. This spacious double bedroom faces over the north carriage drive with its boundaries of Rhododendron. A lovely window seat is an excellent vantage point from which to view the wildlife visiting Home Park. Beautifully furnished with antique oak furniture designed by Shapland & Petter, the Edwardian ‘Arts & Crafts’ furniture makers of Barnstaple Devon. A comfortable king size bed and a relaxing seating with television area make this an ideal place to unwind.The ‘Shapland & Petter’ bedroom has a lovely adjoining private bathroom with basin & WC. 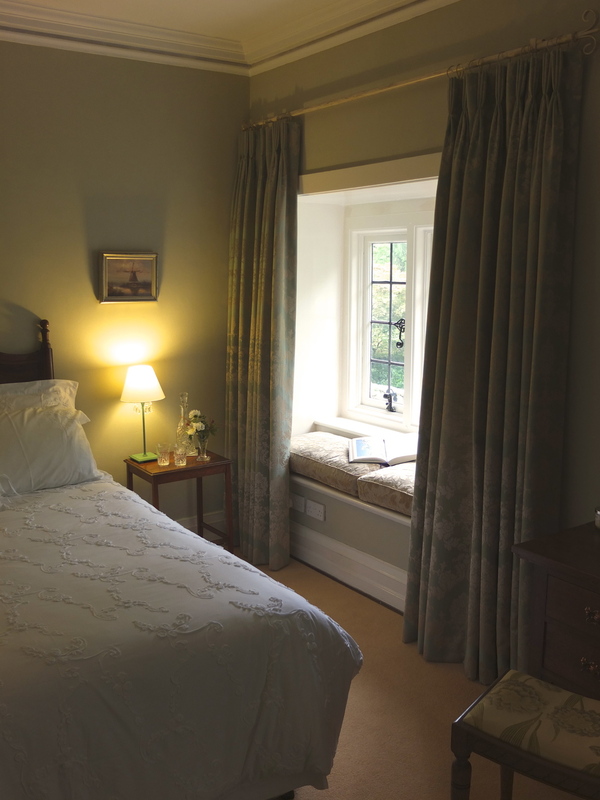 The Parlour Maids’ bedroom is a comfortable single bedroom, with attractive window seat and views across fields to the North of Coombe Trenchard. Red & Roe deer are frequently sighted in these fields early in the morning and at dusk. The Parlor Maids’ bedroom is available to guests as additional accommodation to either the ‘Shapland & Petter’ or ‘Clock Tower’ bedrooms. Ideal for an accompanied teenager or relative. Private Edwardian Cloakroom: with original toilet (modern plumbing!) and basin. Following a restful nights’ sleep, enjoy a choice of breakfasts with locally sourced produce, and eggs from our own hens, served in the beautiful Morning Room, or if you prefer, on the sunny South facing terrace. Sarah is sometimes happy to cook supper for guests, so please do ask if you prefer not to eat out. Two courses and coffee, £20 per person. We are happy for you to provide your own wine. We are blessed with some fantastic restaurants and pubs in the area, almost all of which we have thoroughly researched in the interests of our guests! Links to some of the very best are listed on the Links page, but special mention must go to the Lewtrenchard Manor restaurant which serves world class cuisine and is a bracing 10 minute walk down our driveway! If you would like to stay at Coombe Trenchard, please get in touch to reserve your dates. You can down load a booking form here. For those who enjoy walking, you need not roam far from Coombe Trenchard to appreciate some of the finest scenery in the county. The formal gardens at Coombe Trenchard are open to the public on a few occasions each year. Guests staying in the East Wing are very welcome to walk around the gardens, with prior arrangement with the owners. There are plenty of gardens to visit locally, interesting towns to visit, splendid walks and cycle routes, Dartmoor on our door step, and the coast is about a half-hour car journey away. Our local towns of Tavistock, Launceston and Okehampton are all within 15 minutes drive and Exeter and Plymouth approximately 40 minutes. Our favourite local places to visit are the National Trust properties of Cotehele, Castle Drogo and Lydford Gorge, the Pannier Market at Tavistock and the beach at Crackington Haven. The footpath network locally is particularly good and we are just off the Two Castles Trail which follows a route from Launceston to Okehampton and not far from the Granite Way, the West Devon Way and the Tamar Valley Discovery Trail. Horse riding is available nearby on Dartmoor.